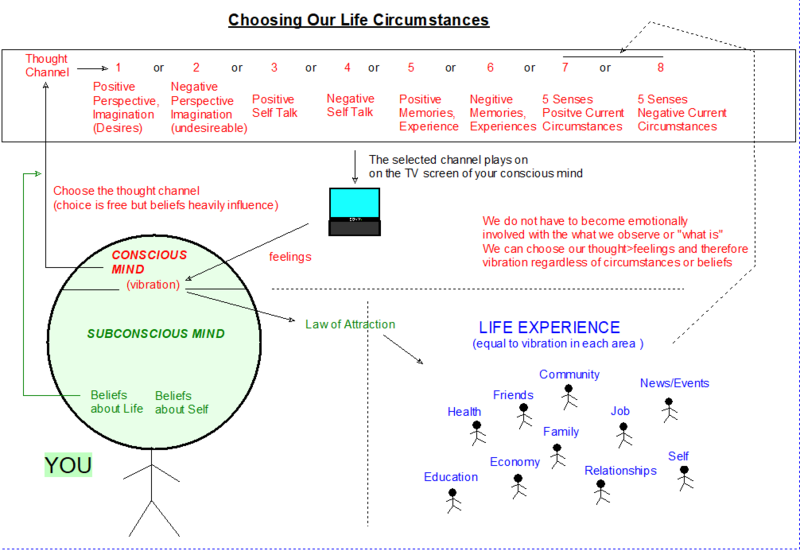 What you will notice in this diagram is that essentially, you can hold one thought-feeling-image on the screen of your conscious mind and there are 8 different “channels” you can choose to watch on that screen – but only 1 at a time. The one you choose simply causes the related vibration to be offered to the law of attraction which then goes out to attract to you a vibration that is equal. Once the circumstance comes, you experience it and you can either use it as an input channel if desired or select another channel if not. 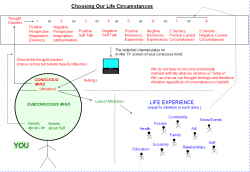 If what you experience in your physical world is not what you want then you will want to stay away from channel 8. Channels 2, 4, and 6 you will also want to stay away from. Channels 1, 3, 5 and 7 are where you will find your most feel good and channel 1 in particular is where you get to set your vibration independent of anything else in your life experience. It’s really where you get to be the master of your mind, the master of your feelings, the master of your vibration, the co-creator of your life, and therefore take charge of your life.